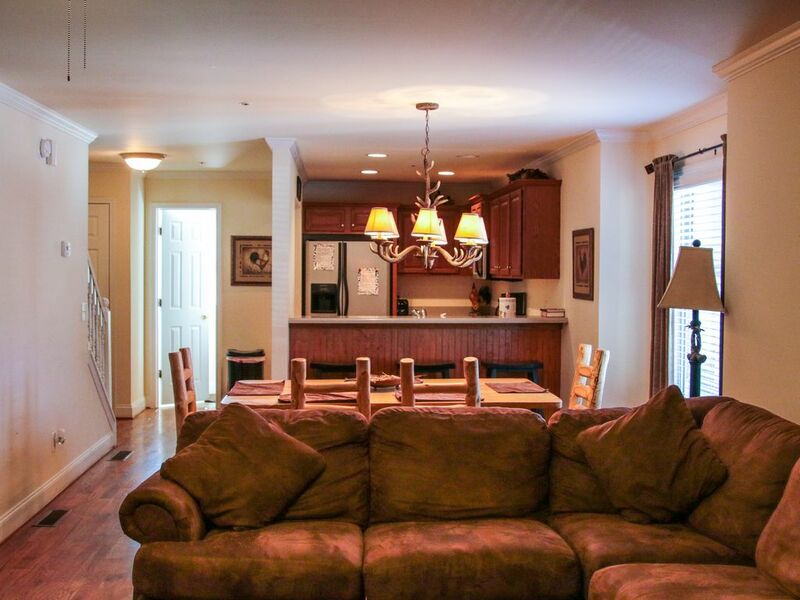 Perfect for couples, families, weekend getaways or extended stay! My cozy and comfortable “Mountain Retreat”is the most convenient housing in Helen, located just one block from Main Street & Betty's Country Store in downtown Alpine Helen. It is a short walk to the shopping area and the Oktoberfest Festhall. Built in 2006, kept up to date and clean. This retreat offers the conveniences of home with a fully stocked kitchen, comfy king sized beds, gas grill, flat screen TV's, DVDs, magazines, books and games for everyone to enjoy! Free Wi-Fi. On the 1st floor is one room with bunk beds - a full size on the bottom and twin on top. The 2nd floor offers a full kitchen, half bath, dining room, living room with large sectional sofa and screened deck with hot tub and gas grill. The 3rd floor consists of 2 king bedrooms each with their own full bathroom. The condo is walking distance from: Betty's Country Store, Paul's Steakhouse, all the downtown shops and the Festhall during Oktoberfest. It is also just minutes from Unicoi State Park, Anna Ruby Falls, Old Sautee General Store, Innsbruck Golf Course, Appalachian Trail, Lake Burton and Lake Chatuge. Explore all of Northeast Georgia with day trips and look forward to getting back to your 'Mountain Retreat'. CONVENIENCE! Since my property is located in downtown you can park your car and WALK. You don't have to worry about traffic or parking. Also walk to Betty's Country Store to pick up the things you need whether it be a band-aid, snacks, drinks, lunch or something great from the fresh meat counter to grill for supper. Each bathroom has a hair dryer and plenty of towels, hand towels and washcloths. Tile floors and showers. We have ramp access to the back door of the unit, but only the first floor King Suite is wheelchair accessible. Full kitchen is located on the 2nd floor and fully stocked with utensils, bakeware, cookware, spices, mixing bowls, serving pieces, etc. If renting the King Studio Suite, the kitchenette offers a mini-fridge, microwave, 2 eye burner stovetop, sink, glassware, dinnerware, silverware, cookware and blender. Wheelchair accessible ramp to 1st level King Suite only. Plenty of parking available. Park your car and walk to downtown Alpine Helen. All TV's are 42' flat screen TV's. Living room is stocked with games, DVD movies for both adults and kids, books and magazines. Great location and fantastic place for our family gathering! We loved the convenience to downtown. The space was fantastic! We reserved the three kings. The space was clean, and we made use of the handicap ramp. The best location. Literally across the street from the grocery store and walking distance to everything. Roomy place with great location! The den was very comfortable with plenty of seating and a large tv and DVD player. Could use more channels, like ESPN for those wanting to enjoy the holiday games! The kitchen had plenty of plates, glasses and flatwear. Only two trash bags and two pods for dishwasher. The bedrooms really need updating as to bedspreads and pillows and there were lots of dead ants in the downstairs shower and a hole in the wall-not too large but should be fixed. Showers good, tubs large, and nice towels and washcloths. Really roomy place in a great location, but needs some TLC and updates. Great owners to work with with quick responses. Perfect place to stay in Helen. Very convenient and walking distance to downtown. Very roomy for 3 couples. Owner was so nice and extremely prompt in responding to any questions we had. It had everything we needed and then some. Nice touch on the Oktoberfest mugs. :) We visit Helen every year and we plan to book this property from now on to continue our tradition. Thank you!!! Spent a long Oktoberfest weekend at the condo. 3 couples - each with their own king size bed and en-suite. Main living area is middle floor with bedrooms on 1st and 3rd levels, allowing those who like to sleep in or go to bed late their own separate floors. This is an end unit with 2 parking spaces which was extra nice during a busy Helen weekend. You could walk everywhere in town and the grocery store is right next door for quick needs. We cooked dinner every night which was a good way to save a bit and have family time. The owner was very responsive to questions. Overall, it was a great stay - one we're looking forward to repeat for future Oktoberfest celebrations! Perfect spot for a getaway in Helen! My friends and I loved staying here. We comfortably slept 10 adults with no issue. The property owners were wonderful - very communicative. We would love to come back and stay here again. Highly recommend this property. Cleaning fee included in rates! With optional King Suite, pricing is as follows: 3 King Bedroom + bunks $300/night Oktoberfest 3 King + bunks $400/night $200 refundable deposit required Credit card payment available via PayPal All rates include cleaning fee, linens and starter paper products.